You've probably heard a lot of buzz about "lean startups". You may wonder if it's mere hype, applies just to tiny bootstrap ventures, or if adopting some lean startup methods might actually benefit your company. is that the process of learning the market, and learning what makes the product successful, is slow and unreliable. Sometimes they suffer analysis paralysis, swerve from one big deal to the next, allow conventional industry wisdom to stifle innovation, or squabble over uninformed personal opinions. In other cases, they make decisions quickly but fail to learn from their inevitable mistakes until after they've invested exorbitant amounts of time and money. If you find that your organization is facing this problem, it's worthwhile to consider lean startup methods. Collect data. Practitioners observe and interview prospects to gain qualitative insights into their situations, challenges, and the ways they operate. They also examine quantitative data for further insights. Form hypotheses. Based on their observations and insights, practitioners form and capture hypotheses about the business model for their products. These hypotheses include the problems to solve, the key elements of the solution, the unique value proposition, the buyer and user personas, key metrics or user activities, costs, and revenue streams. Hypotheses may also include measurable predictions of the impact of various marketing or sales tactics. Conduct experiments. Recognizing that at least some of their initial business model hypotheses are likely to be wrong, practitioners design and run experiments to test the hypotheses. Often these experiments confront prospects with real-world choices (such as functional product) and measure how prospects behave when confronted with these choices. Learn and adjust. Having conducted experiments to test hypotheses, practitioners analyze the results and adjust their hypotheses. These activities often occur in parallel and not necessarily in this sequence. For example, entrepreneurs commonly think of product ideas prior to formally collecting market data. Applying these methods in an iterative or continuous fashion enables product teams to confront product strategy risks and quickly and reliably learn markets with more targeted - and ultimately, less wasteful - business investments. Lean startup practitioners essentially apply agile methods to the entire business for a product. Most software companies have adopted at least some agile development practices. But unlike companies that iterate merely on the development of the product, lean startups iterate on the requirements, the positioning, the target markets and personas, and sales and marketing tactics. They monitor and optimize the sales and usage funnels. They emphasize the delivery of working product and prospect-touching experiments over exhaustive planning and documentation devoid of external feedback. Learning markets reliably and expeditiously, and learning what will make products successful, is one of the primary challenges many companies face, whether those companies are startups or large, established corporations. By applying scientific practices and agile principles across the entire business for a product, lean startup is designed to address this challenge. How does your company currently make product decisions? How would you know it's time to add new approaches or practices to the mix? The next blog entry will explain how you can begin to put some lean startup methods into practice right away, once your team is ready for some change. 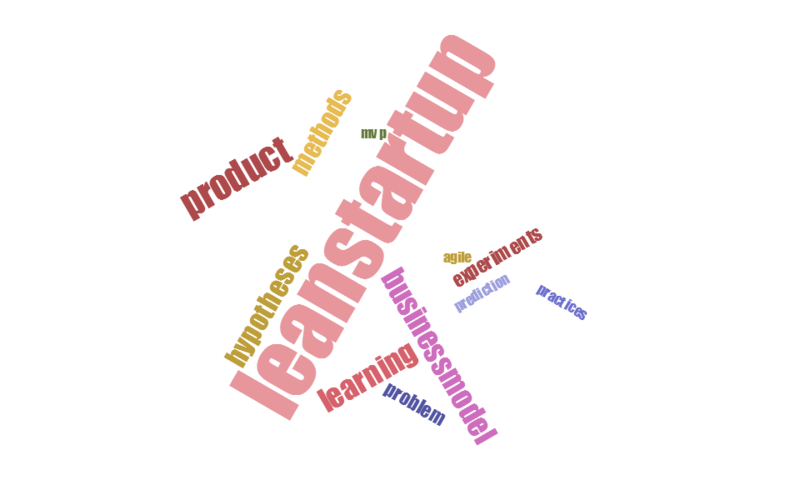 Thanks to Koen Bosma, Ash Maurya, and Emiliano Villareal for providing helpful feedback on this blog entry, and for their thought leadership on the topic of lean startup methods. It seems that #3 Experiment is where most companies drop the ball. They consider failed POCs as "wasted time", when the reality is that millions were likely saved knowing in advance of full scale development that the idea wouldn't succeed. Based on my experience and some of the executive interviews I've recently conducted, it does seem purposeful experimentation is not very common. The exception is some limited A/B testing on UI options. A lot of companies also fall short on the collection of data through prospect interviews. "I demoed our solution, and the prospect said it was f*ckin' cool!" does not constitute reliable hypothesis validation or market learning. They make this and other typical mistakes when visiting with prospects. I agree with Mike, gathering experimental data is tough and most teams don't know how to do it. Any tips? Thanks, Bruce. I'll have some tips on applying lean startup methods in an upcoming blog entry. Some of the tips will address purposeful experimentation and the gathering of data from experiments. In the meantime, do you have any tips you'd like to share?